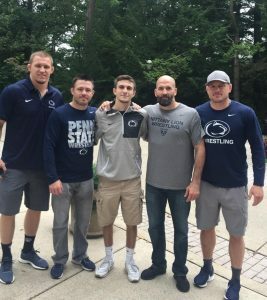 Congratulations to Monroe Woodbury senior Marco Vespa who has made the decision to continue his academic and athletic future at Penn State University. Vespa is already a 5X Section 9 placewinner, 4X Section 9 finalist, 3X Section 9 champion and a 2X NYS placewinner. Marco finished 4th in the state as a sophomore at 113 and 3rd in the state at 120 last season. Vespa will be joining the most powerful wrestling program in the nation. Penn State has won 7 on the last 8 NCAA D1 wrestling championships and they have crowned 19 individual national champions during that same span. Great job Marco…Section 9 strong, Section 9 proud!!! !